You are here: REDWOLF > Home > News >News Detail - MAGNUM & TURBO Motors & Shooting video - WOW! 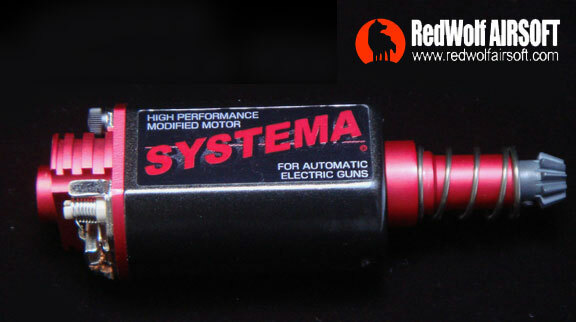 Brand new Systema motor is a breakthrough product for the AEG airsoft gun industry. Delivering faster rotations and greater torque in one package, this new motor takes your high powered Automatic Electric Gun to the next level! In the past, super high speed and ultra high torque were complimentary features that you could not find in a single motor. You could either get a high speed motor, or a high torque motor. Recognizing a major need for a motor that could provide both, Systema embarked on a year long design that finally brings both these features in one package. Employing a break-through design, the new high torque motor, called the MAGNUM, will be equally at home in high-speed or high-torque setup, while beating the performance of all previous generation motors - even those specifically tuned for high-torque or high-speed applications. RedWolf's inhouse test of the MAGNUM motor have been impressive, with the new motor pushing M170 to M190 springs comfortably! This new motor is so full of torque that it compresses the spring more powerfully which actually generates a slight increase in FPS simply by installing this motor in a pre-existing upgrade setup. Despite the high torque, the motor still retains incredibly high speed and on a 12V battery, it shoots an M170 spring as fast as any regular AEG on a large 8.4V battery. That is an incredible feat! - Individually balanced commutator, meticulously aligned bearing inserts, and new CNC-machined aluminum end bell combines to ensure rotor stability at extreme speeds. For those of you who seek for ultra-high rate of fire performance, Systema's TURBO version delivers 30 revolutions per second (which far surpasses the current performance of the Marui EG1000). This performance can be attained in conjunction with a 9.6v 2400mah battery and standard ratio gear set. The TURBO motor trades speed for torque, and therefore can only be used in gearboxes with springs that are rated M135 or less. In our in-house tests, we installed the TURBO motor in a 400fps upgraded M4 running a 12V battery. The results were so impressive we had to hang our mouths open. The rate of fire is like nothing we have ever seen and it felt like we were shooting a garden hose, spewing out a constant column of plastic. The BB's come out so fast and so powerfully that we could cut cardboard boxes in half within seconds. This TURBO motor will force many people to buy auto-winding magazines given how fast it can empty a standard or wind-up high capacity magazine. Truly impressive! Now in stock at Redwolf! M170 Complete Mechabox Set Building on the high performance of it's MAGNUM motor, Systema is able to push the limits of its complete MECHABOX design and take up to an M170 spring for massive power delivery well over 500fps! The new mechabox comes with a MAGNUM motor to make this possible! Introducing the new Systema Mecha-Box and Motorset, comprising of the latest and finest parts from, including the latest Systema motor, which is a breakthrough in motor design and sets a new standard benchmark for motor performance. The Mecha-box is a pillar of strength, with a really rigid structure, thanks to the innovative design of the casing, and the parts are of the highest quality. 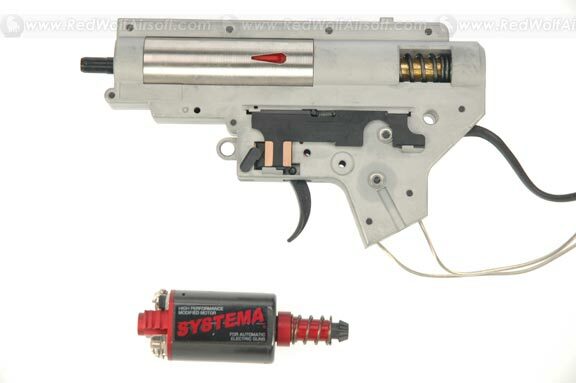 As you know, Systema have developed, manufactured and sold MARUI electric gun parts. SYSTEMA parts are our main goods that boast the variation of 317 items now. We offer our products that our most important purpose is captured electric guns custom itself as a hobby as our most important purpose. However, on the other hand, an electric gun is a gun so that some customers have a first policy to make improvements of three elements of: power, accuracy and operationally as a gun as much as possible. In short, we can?t ignore the needs that they would like to obtain only the performance of SYSTEMA power easily. In order to respond to those customers needs positively, we achieved a conclusion that general F.T.K. (Full Tune Up Kit) would not be sufficient. Now we manufactured this new product SYSTEMA COMPLETE MECHA BOX (SYSTEMA INTEGRATED MECHA BOX). The concept of the product is very simple. Everybody can enjoy the SYSTEMA parts fully without specific techniques or knowledge. A tool you need is only one plus driver. We hope you make fuller better use of live-firing performance of ultimate custom parts. It goes without saying that MECHA BOX is a core of function of MARUI electric gun and at the same time, the outside dimension is a pillar of rigidity of the whole gun. So it is important not only to trace accurately and manufacture it, but also to devise various ways to improve the function. For example, increasing wall thickness of part that comes in contact with the tappet plate corrects twist or deflection and control jamming on driving with high speed. It is rare to use a gear in the structure of a real gun. In short, we think noise generated by the gear should be inhibited as much as possible. A noise generated by a pair of gears engaged correctly may be certainly comfortable, but we are willing to strive to inhibit even that noise by increasing wall thickness of the case as much as possible. As an inevitable consequence, the rigidity of case itself is secured at the same time. In this product, there are eight bearings are selected and placed adequately as each usage. Especially, the radial bearing for the gear brings out a performance of our specialty high accuracy gear as much as possible by strictly controlling the set measurement. There are reasons why the case can't be damaged. Some people say 'I replaced a custom MECHA BOX, but when I used a strong spring, it was damaged'. The reason of this damage is covered with a case structure. The case of SYSTEMA MECHA BOX is no different in it's manufacturing method from other products as it is also die-cast. However, it is required to have draft in each part of the case for being die-cast. In general, only a tiny part of periphery of the cylinder head comes in contact with the case due to the draft on a front of the case where the case comes in contact with the cylinder head. If you give a strong impact on this part from backward, a power trying to separate will add to right and left cases. This is the cause of damage. As a countermeasure, it is designed that this part's draft is zero, so the strong impact from the piston will be received by whole area of the case and be attenuated. That's the reason of Systema's excellent durability of the MECHA BOX case. SYSTEMA switch device is a best seller item that protects the terminal from excessive current which flows into the switch, by a very simple structure. However, the board itself needs a power supply structurally, which some people have issues with regards to the wiring. However, this time only a kit installed M150 spring can be delivered with completed wiring. In this case you can enjoy the dynamic shooting taste of ahigh rate spring by installing a Systema Mecha-box.